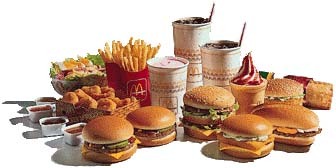 WARNING - the information in the following pages has been produced to persuade you to buy more of McDonald's products. Keep your eyes and ears open for propaganda when you see this symbol. McDonald's official book of information about themselves, "provides a detailed insight into every aspect of the company"
What's in McD's new veggie burgers. Produced for distribution in McDonald's stores, contains a table of nutrition information. Find out exactly how much fat, fibre, protein etc. is in every item on the McDonald's menu. Lists every ingredient in every menu item - includes E-numbers, plus the revised table of nutrition analysis. What do McDonald's do to help the environment? WARNING - the information in the following ouside link(s) has been produced to persuade you to buy more of McDonald's products. McDonald's corporate website - a glossy, expensive attempt to counter McSpotlight. But why is there no email address for visitors to send in their opinions? And will they ever put a link to us as we have to them? Enterprise Dec 95 - fascinating McFacts about the world's favourite family restaurant. What we're all about. , Balance. More about your balanced diet and McDonald's good food. Adverts so deceptive that McDonald's were told not to show them. "They hope to justify their existence, to counter criticism, to ingratiate themselves with local communities and to target sections of the population who they want to buy their products. And what better way to do this than to be seen to be 'helping' the community, doing 'charitable' good works... "
How McDonald's work with schools - from their 1993 annual review. Activity School Pack - a McDonald's 'Teaching Aid' produced in conjunction with Berkeley Infants School. Dealing with the exploitative nature of 'loyalty' schemes and the not so innocent concept behind educational packs 'donated' to schools. "When someone like Robert Maxwell or McDonald's take regular advantage of the archaic and oppressive libel laws they hope to be able to create a climate of intimidation..."
Our Growing Investment Financial page from McDonald's Annual Review 1993, containing information about investment, expansion, franchising etc. McDonald's Stock details (Outside Link) - how are McDonald's shares doing today? Got something to say about the burger giants? The McDonald's section of the Debating Room is for you.